went great, got to hang with troy from 420vapezone, the Puffitup crew, and a bunch of other cool internet people. We just went as visitors, but in the future we want to have a full booth. StemPod is almost fully launched, we have been trickling out units while waiting for our wooden StashPod packaging. Thanks! Ahhhh, Bud's Lil'Bud that you snagged , I just seen that in his clearance, right on man! Edit : awesome @SuperShredderDan, sounds like you had fun and got to meet cool peeps! Glad to hear , man! Vape on! I have heard from so many critics that review vaporizers ( I think I heard Bud say something about this once?) saying that with time the Crafty begins to have performance issues with the power button? Is that right, or is it another problem that people run into with Crafty after ya get some hours on it? I would hope that S&B will improve on one of their better performing vaporizers. Instead of creating a potential flop like I think Davinci may have already invented, but I could be wrong. The micro-dosers out there may love and buy this new MIQRO by the tens of thousands. I guess ya never know until a newbie hits the market. I beleive that the main hit against the Crafty was the thermal fuse and the single battery. The single battery, IMO, made for a more critical design with a bit more failures than anyone wanted to see. I believe that is much improved as I just don't see people complaining about Crafty failures like they did...oh, maybe 18 months ago or so. I still like the Mighty better as all controls are on the device and I hate being chained to a phone app. Also, two batteries seemed to make for a less critical and stressed design. All vapes with Lithium type rechargeable, built-in, batteries will fail in time as Li batteries are limited by a qty of charge/discharge cycles lifetime. They just have a limited lifetime. All of them. You know I did see a video a man made and now that I heard it again it was a video of him replacing the thermal fuse. That wasn't you who made that video was it Baron23? Haha But I remember on that video when he wrapped up the repair he said that the thermal fuse was like $1 so he bought a handful of them. I had thought I heard the button at the bottom I assume it is a power switch was the problem. But I remember that I heard the thermal fuse too, case solved. nope, not me. Can’t remember who posted that on FC. Maybe Jcat. Yeah, power buttons fail, but haven’t heard much of that lately either. The thermal fuse makes a lot of sense as the source of the problem. Most products that employ them do not want you to fix them. If you do it wrong, or worse yet omit it altogether, you set yourself up for bad things happening. We had an issue with a very nice coffee maker that just stopped working and after investigating it was indeed a thermal fuse. A couple bucks and it was fixed. Amazon even had the part. Also try Digi-Key for parts and use iFixit as a source for specialized heads for weird screws. They sell an awesome kit for about $50. I used a triangular head for my fixit project. Glad to see people fixing stuff. @VapeCritic that will be great to give tools to people to solve their own problems Cheers for that mate!!! 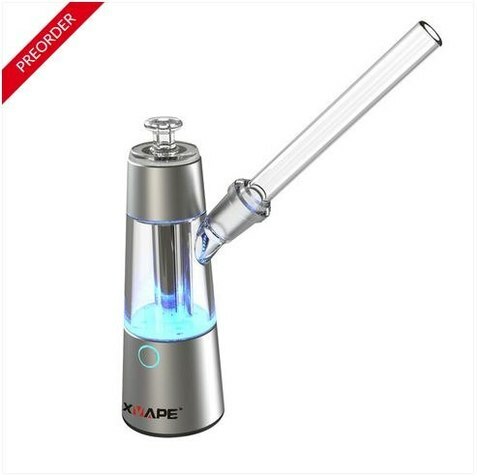 Looks like another entry into the "Let's package an atomizer into a sleek looking appliance-like enail rig" product category with the Peak and the Switch. It even has the almost category defining light show. The seventy's called and they want their lava lamp back. hahaha....hey, Lave Lamps are cool (and expensive too! :gasp: :lol: ). Once I have better access to dabs and such I was going to look into a vape option for that. But the comments above make me think the pen styles are just as good as a Peak or a bigger desktop extract vape. Am I right? the HVT Sai TAF is surely just as good as a bigger desktop, im talking about the EVO which i own, never tried the Peak or others desktops with concentrates...def a portable DAB Rig. plenty of threads talking about that pen. Can we try and stay on topic? I often go off topic when medicated. they announced it on FC. I am assuming quartz heaters for the ELEV8R, but who knows?